Born in Philadelphia to Englishman Charles Day and Anna Rebecca Miles Day, Frank Miles Day was both president and valedictorian of his class in the University of Pennsylvania’s Towne School. After graduating in 1883, Day traveled to England where he studied, apprenticed, and observed architecture; this time included stints as a student at the South Kensington School of Art and the Royal Academy in London and as an apprentice in the London studio of architect Walter Millard. Upon his return to Philadelphia in 1886, Day worked briefly in the offices of George T. Pearson and Addison Hutton before opening his own office in 1887. 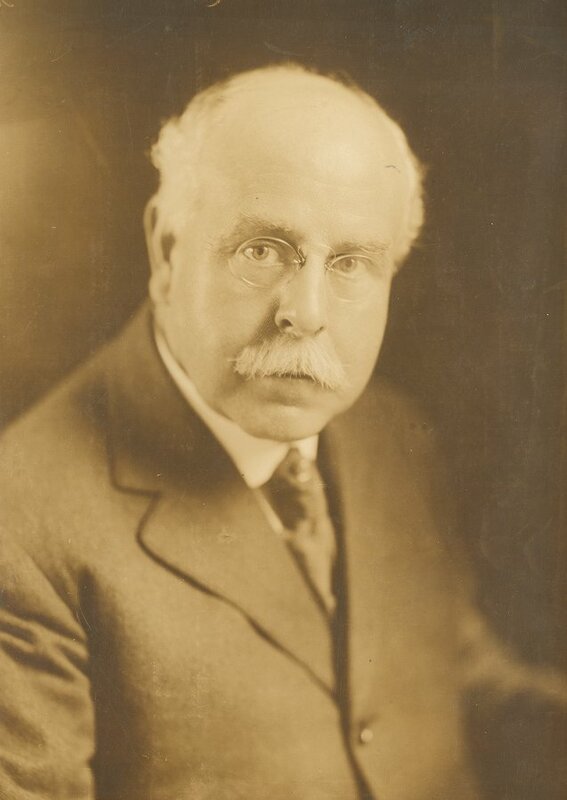 His first partner was his brother Henry Kent; Charles Z. Klauder joined the firm in 1911. The firm of Day and Klauder received commissions on the campuses of Princeton University, Cornell University, Penn State University, the University of Colorado, Wellesley College, the University of Delaware, Yale University, Johns Hopkins University, and New York University. Most of these college buildings designed by Day and Klauder were in the English Gothic style. At the University of Pennsylvania, the firm was responsible for supervising the construction of Houston Hall (1894, design by students William C. Hays and Milton B. Medary) and played a role in the architecture of the University Museum (1895-1899 with Wilson Eyre, and Cope & Stewardson). Day was responsible for the design and construction of Weightman Hall and a low stadium for Franklin Field (1903-1905). After his death in 1918, the firm of Day and Klauder was commissioned to build the Palestra and Hutchinson Gym (1926-1928), Franklin Field (1922, 1925), and the Coxe (1926) and Sharpe (1929) Wings of the University Museum. Day also served as a lecturer in architecture at the University of Pennsylvania from 1890 until 1904. In 1918 he was awarded an honorary degree of doctor of science from the University of Pennsylvania.